Every day has been another second, minute or hour of learning. Anyone could know where to find fish if they are on the surface but in the case when they aren’t feeding on surface what does one do. We are back to the days of good ol’ fashioned scouting. Miles upon miles are traveled looking for birds, bait or any chance of fish being in the area. After all we are fishing not catching right? We’ve been alternating from north to south the last couple of weeks and have been fortunate to find fish in the same area. A offshore storm caused a disturbance this last trip we had and turned the water from blue to green. We had a friend come down and wanted to fish the weather looked great and we were all loaded to go so first day we headed south where we stumbled across at least 100 hungry marlin the only difference was these guys didn’t want to catch more than one marlin so we looked about and trolled for a while with nothing else showing up to cooperate. We caught a few marlin and released them for others to enjoy. Second day we decided to head to the bank off to the north of us “thetis” we trolled as soon as we got there and saw a few tuna feeding on the surface. I was on the t-top glassing off in a distance I seen a slashing in the water one that I am familiar with so we decided to put everything out with a wire leader. As soon as we were in the area 4 trolling rods bent over. What a sight to see we got all four fish in and it was on adrenaline pumping, everyone on edge. 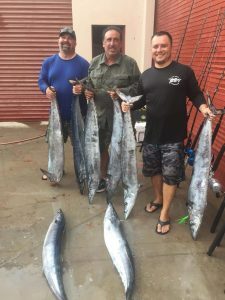 We made a few more passes and it was a short lived moment but none the less these guys were happy we went 8 for 12 on the wahoo. It’s safe to say they had a great day and for someone who hadn’t fished wahoo before it was awesome to see the smile he had.